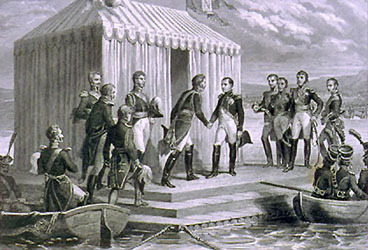 In July 1807, Alexander I, Emperor of Russia, and Napoleon, Emperor of France, met on a barge in the middle of the Nieman River at Tilsit in East Prussia to sign a peace treaty and alliance that dramatically altered the balance of power in Europe in Napoleon's favor. As I recall, there were very difficult, and protracted, negotiations on how to precisely arrange the meeting of the emperors on the raft, e.g., who would leave shore first, who would arrive first, who would greet whom on the raft, etc. I think that I know who was on the raft first, but here is an extra credit opportunity for you. Do some research and let me know exactly how this diplomatic encounter took place. Read the textbook chapter 25. Read a short excerpt from Prince Adam Czartoryski about Alexander I's intent to reform Russia. Check the remarks by Professor Blois and Professor Evans on Alexander I. If you have not done so already, now would be a good time to review my interactive lecture on Russian geography. Read my note about Tolstoi's idea about history presented in his great novel, War and Peace, which is about 1812. Read chapter 19 and chapter 20 from Mary Platt Parmele (1843-1911) A Short History of Russia (1907, 4th edition). These are short chapters, and this is optional reading. For 50 points maximum extra credit, watch Waterloo (1970) and write a one-page paper assessing the film's historical accuracy. Also let me know whether you enjoyed the film. For 50 points maximum extra credit, read Lev Tolstoi, War and Peace (1863-69) and write a one-page paper explaining why you read the entire book. Also, let me know your favorite scene and why. For 50 points maximum extra credit, read Marc Raeff, Michael Speransky, Statesman of Imperial Russia, 1772-1839 (1957) and write a one-page paper that explains why Speranskii was unable to enact substantial political reform under Alexander I. For 50 points maximum extra credit, read Roger Parkinson, The Fox of the North: The Life of Kutuzov, General of War and Peace (1976) and write a one-page paper that briefly highlights some of the general's life and that discusses his strategy in the 1812 campaign. For 25 points maximum extra credit, write a paragraph in which you compare and contrast the start of Napoleon's invasion of Russia with its finish.